There are 16 autonomous district councils (ADCs) in northeast India, facilitating the socio-economic development of tribals, who make up 28 percent of the region's total population of around 45.58 million. Agartala, May 19 : The Tripura tribal council will be be made a model autonomous body in the northeast India, ensuring alround development of tribals, its new chief Radhacharan Debbarma said on Monday. "TTAADC (Tripura Tribal Areas Autonomous District Council) would be made a model and best council in the northeastern region by achieving alround development of the tribals," the council's new Chief Executive Member (CEM) Radhacharan Debbarma told reporters. "Already our council became one of the best tribal autonomous bodies in the northeast India," he said. "The other tribal autonomous bodies of the northeastern region have earlier taken lessons from the TTAADC for their alround performances and welfare of the tribals." Of the 16 ADCs, mostly formed under the Seventh or Sixth Schedule of the Indian Constitutions, six are in Manipur, three each in Assam, Meghalaya and Mizoram and one in Tripura. Tripura's ruling Left Front led by the Communist Party of India-Marxist (CPI-M) in the May 3 elections to the 30-member TTAADC retained the tribal autonomous body for the third consecutive term. 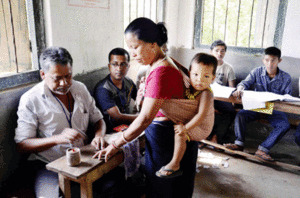 Elections were held for the 28 seats of the 30-member TTAADC, which has jurisdiction over two-thirds of Tripura's 10,491 square km territory. The government nominates the remaining two members. All the 28 seats were won by Left candidates, with the CPI-M sweeping 25 seats. Its allies Communist Party of India, Revolutionary Socialist Party and Forward Bloc won one seat each. Radhacharan Debbarma, a veteran tribal leader of the CPI-M, along with eight executive members on Monday assumed office at a colourful function at TTAADC headquarters in Khumulwng (25 km northeast of Agartala), where Chief Minister Manik Sarkar, his council of ministers, senior political leaders and top officials were present. Tripura law department secretary Data Mohan Jamatia administered the oath of office and secrecy to the nine executive members, including 54-year-old Radhacharan Debbarma, a most vibrant face among CPI-M tribal leaders. The CPI-M replaced Ranjit Debbarma, another veteran tribal leader, by Radhacharan Debbarma in the key post of CEM. Debbarma would be the chairman (like speaker of the state assembly) of the council subsequently. Since its formation in 1982, the Left Front has controlled the TTAADC except on two terms -- 1990-95 and 2000-05. In 1990-95, the Congress-Tripura Upajati Juba Samity, a tribal party now defunct, controlled the TTAADC. The tribal-based local party Indigenous People's Front of Tripura ran it in 2000-05. The CPI-M enjoys substantial support among the tribals and non-tribals in the state. After the formation of The TTAADC 33 years ago under the seventh schedule of the constitution, its authority was upgraded in August 1984 to protect and safeguard the political, economic and cultural interests of tribals, who constitute one-third of Tripura's 3.7 million population.